“Radio Retaliation is definitely a more overt political statement,” says Rob Garza of Thievery Corporation. “There’s no excuse for not speaking out at this point, with the suspension of habeas corpus, outsourced torture, illegal wars of aggression, fuel, food, and economic crises. It’s hard to close your eyes and sleep while the world is burning around you. If you are an artist, this is the most essential time to speak up.” So that’s exactly what they do with their new album. Recording in their Washington DC based studio, Rob Garza and Eric Hilton, better known as the international DJ and production duo Thievery Corporation, have managed to blossom in the heart of a city they often refer to as “Babylon;” a poignant reference to the traditional Rastafarian distaste and distrust of a corrupt and unjust modern system. Although the city is best known as the seat of an aggressive American Empire, paradoxically Washington DC has long been the home of a music subculture legendary for fierce independence, a staunch do-it-yourself work ethic, and conscientious social activism exemplified by genre-defining pioneers like godfather of go-go Chuck Brown and indie punk rockers Bad Brains, Minor Threat and Fugazi. Likewise, although some may lazily pin Thievery Corporation as the soundtrack to their cocktail infused late night soiree, the duo have always drawn deep from the well of independent and confrontational music subculture their home town is known for, to produce an ever expanding globally conscious catalogue of music that is difficult to classify. Starting in 1996 with two international underground hit vinyl singles “Shaolin Satellite” and “2001 Spliff Odyssey,” released on their own indie record label ESL Music, Garza and Hilton soon released Sounds from The Thievery Hi-Fi; an album that defined a genre and crystallized their distinct “outernational sound” aesthetic. Over the next decade the duo would remix the likes of David Byrne, The Doors, and Sarah McLachlan, and record three more critically acclaimed albums of original material, each one transcending the last in scope, style, and message: The Mirror Conspiracy (2000), The Richest Man in Babylon (2002), and The Cosmic Game (2005). 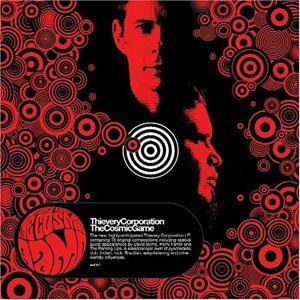 Now Thievery Corporation gear up to release their incendiary fifth independent studio album, Radio Retaliation, in September 2008. Radio Retaliation finds inspiration in the uncompromising political music of groups like the Clash, Public Enemy, and Fela Kuti and is without a doubt Thievery Corporation’s broadest and most progressive album yet. The album imparts tough socio-political messages largely absent from today’s popular music. With Radio Retaliation Thievery Corporation raise the bar with a new cast of musical collaborators including Nigeria’s afro-beat heir Femi Kuti, Brazilian star vocalist and guitarist Seu Jorge, Indian sitar virtuoso Anushka Shankar, Slovakian chanteuse and violinist Jana Andevska, and Washington DC’s own go-go originator Chuck Brown. Also returning are long time microphone co-conspirators Sleepy Wonder, Lou Lou, Notch, Zee, and Verny Varela. A defining element of Thievery Corporation’s sound has always been its decidedly organic quality and this is clearly evident in the rich productions of Radio Retaliation and recent live tour dates. Despite their minimal beginnings, Garza and Hilton have adopted a growing cast of collaborators over the years, vital musicians and vocalists who contribute to a dynamic 15 member live band. Playing sold out venues and festivals worldwide, Thievery Corporation dazzle thousands of music fans every year with their kaleidoscopic live show. Having a list like this is great to motivate you towards achieving great things before you turn 30. Below is a list of things I have chosen that I would like to do by the time I am 30 and I believe some of these will be the same for you and some will be different. Have a look at them and pick and choose which ones you want for your life. Your 30 things which you want to achieve by the time you are thirty can be anything at all. They can range from areas such as fiances to relationships and anything else you can think of. I want to challenge everyone to create a list of 30 things to do before you are 30 and to post it on your site or write it on a piece of paper that you can view everyday. If you are over 30 then do 30 things to do before you are 40, or 50, or 60. As you can see this is a pretty solid list of 30 things you can do before you turn 30. Not all will be for you, but some will. Write down the ones that are and then add some of your own. Please let us know about your list of things to do before you reach the ripe ol’ age of 30 by using the comments section below.